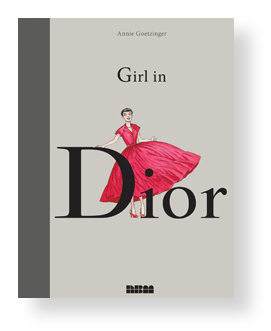 We are very happy to announce our newest book: GIRL IN DIOR. Creator Annie Goetzinger portrays the origins of the House of Dior and its captivating leader, Christian Dior, all through the eyes of the fictitious Carla, fledgling fashion journalist whose life is about to take an exciting turn. This biography docudrama was originally printed in France to great acclaim and is now being translated to English after much request. See the solicitation in this month’s Diamond Previews magazine for February! See previews, articles and more here. GIRL IN DIOR will be available everywhere in March. 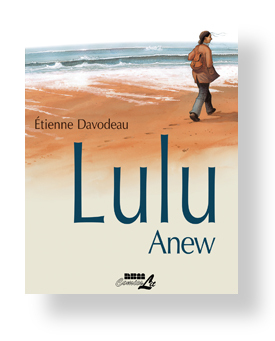 We are finishing up the translation of Lulu Anew by Etienne Davodeau and I have to say, it is a gripping book. As the pages pass by my desk, this familial drama unfolds and I can’t wait to find out what happens! It’s a mystery, a romance, a tale of empowerment and weakness all rolled into one. Our NBM omnibus will collect both volumes of the French work. I just finished looking over Volume 1 and it reminds me a bit of Kate Chopin’s classic novel “The Awakening” mixed with a bit of “Death of a Salesman” or a Tennessee Williams play. 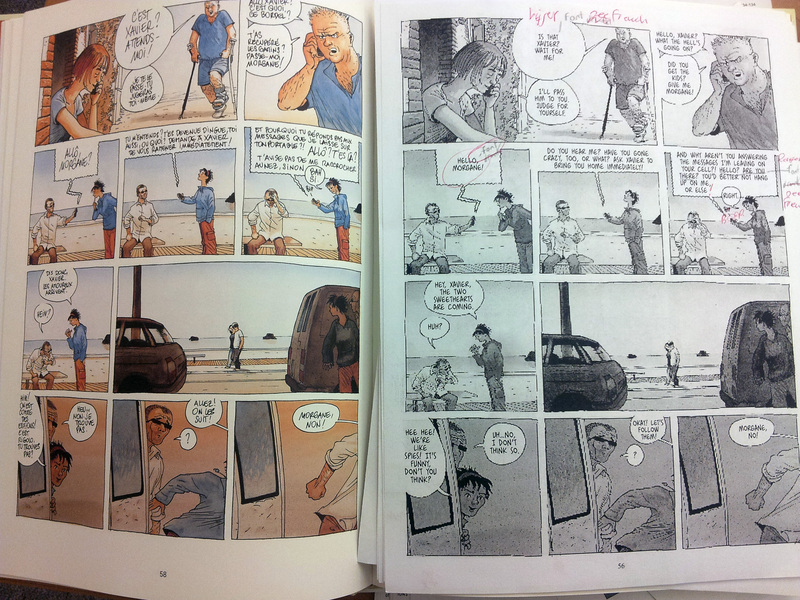 Comparing our translation to the original French is interesting as you get a feel for their writing style and how they fill the word balloons. We decide minute details as to whether a person uses “huh”, “eh”, or “right” to validate their question and if a 16 year old girl would chose this word over that. But still, I get carried away in the story. The story is told during a gathering of friends and family of Lulu, a mother and wife who decided to leave her life behind, if only for a few days. There is tragedy and triumph in how the family (and close friends) cope and grieve and deal with Lulu’s need for a break. 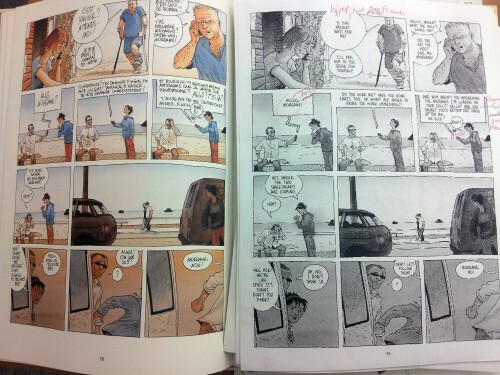 In France, the graphic novel, which sold 200,000 copies, even inspired a major motion picture. Lulu femme nue, with Karin Viard in the title role, was released early this year. Lulu Anew will be out in March. We will keep you updated when new information becomes available. 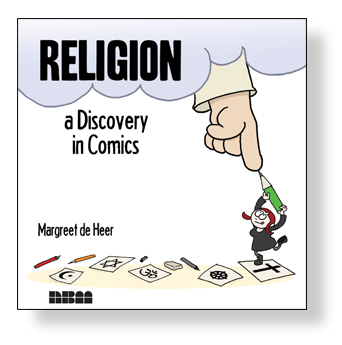 For now, check out the preview pages here. According to my sources at NBM, my new book, All Star, will be in comic book shops on March 12th (Jack Kerouac’s birthday)(sweet) and in regular book stores on April 1st (Jimmy Cliff’s birthday)(the harder they come), but this Wednesday you’ll be able to pick up the first chapter for ninety-nine cents on Comixology! And after that the whole book will be coming out chapter by chapter. Yeah, man! 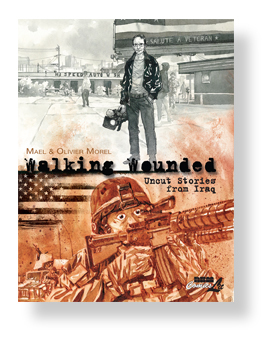 The only way you could get these before was to be in the greater Boston area or see me at a comic convention, but now, thanks to modern technology, you can be anywhere in the world and get a look! Author Jesse LonerganPosted on February 9, 2014 Categories BlogTags All Star, Coming Up, Comixology, Jesse LonerganLeave a comment on Comixology!